Have you ever eaten a cooked radish? Did you know that, when cooked, they taste very much like a potato? It only makes sense, because they are both root vegetables, but I was still surprised by it. I am so used to seeing raw, cold radishes on something like a salad that it never crossed my mind to roast it! My mom, however, roasted some with a little olive oil and sea salt, and it was incredible! The pungent radish flavor was gone, and it had a wonderful new appeal to me! Going off of this experience, I decided that radishes might be a fun way to spice up a boring kabob. I tried roasting them with chicken and BBQ sauce, which was a wonderful twist! The key (which you can see I didn’t actually apply when taking this photo) to perfect roasted radishes is to make your radish half the size of your chicken pieces. This allows the radish enough time to fully roast before the chicken is done cooking. If they are too big, they will still be raw and your chicken will be dry. If you follow this rule, though, you won’t be disappointed! Soak the wooden skewers in warm water, for about 30 minutes. Preheat the oven to 425 F, or the grill to medium-high. Cut the chicken pieces into 1-inch cubes. Put in a bowl and coat with the BBQ sauce. Quarter the radishes (making them 1/2 the size of the chicken pieces). Put them in a bowl and toss with oil and sea salt. Put the chicken and radishes on the skewers, alternating as desired. Oven: Place the skewers on a broiler pan or cookie sheet and bake in the oven for 15-20 minutes, turning halfway through. 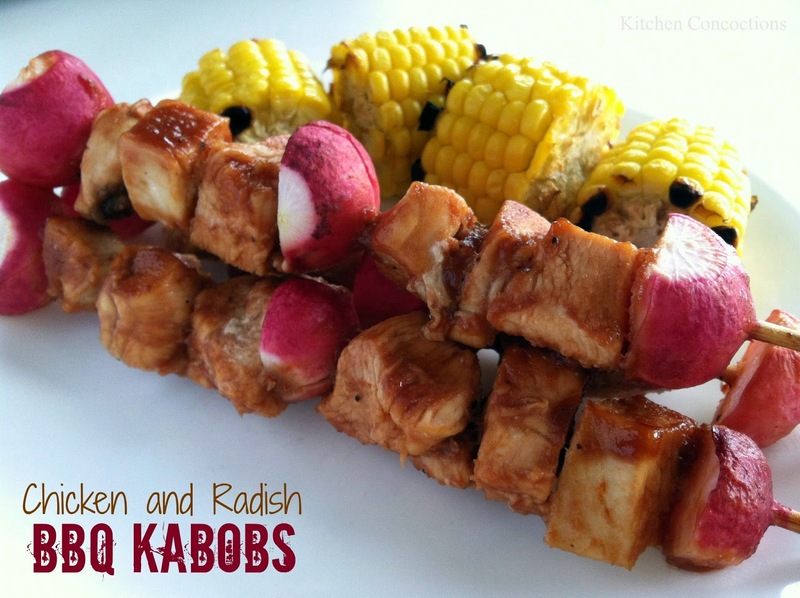 Check the radishes for softness and check that the chicken is fully cooked before pulling the kabobs out. Grill: Place on the grill and cook 8-10 minutes, turning occasionally, until the radishes are soft and the chicken is soft.